A couple of weeks ago my family and I stayed in a cottage on the west coast of Scotland for a long weekend. It's one of those rental-by-owner properties, and it was really nice. There were loads of interesting things on the shelves including knicknacks, pictures, and lots of books. There was even a real (empty) ostrich egg! Being nosey, of course I had to look through everything. 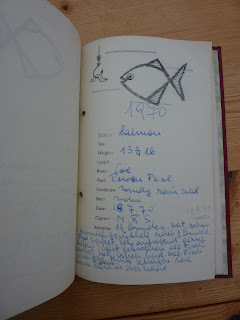 On the shelf with the books I found this amazing fishing journal. 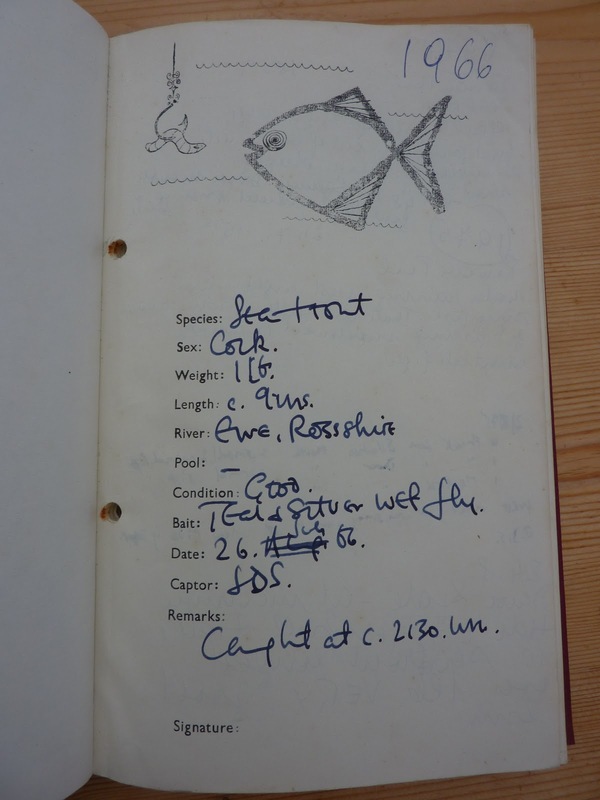 It holds detailed records of everything this fisherman caught from 1966 to 1976! 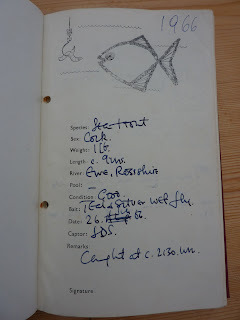 Amazing details of each catch are recorded. The first page of each year has that year written at the top. There are a few summary pages that I don't understand. 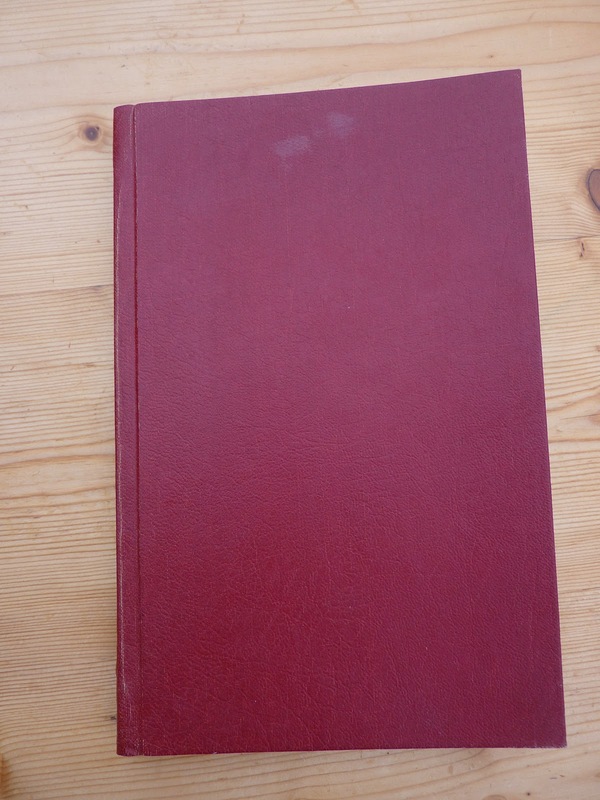 The book is bound in cloth. 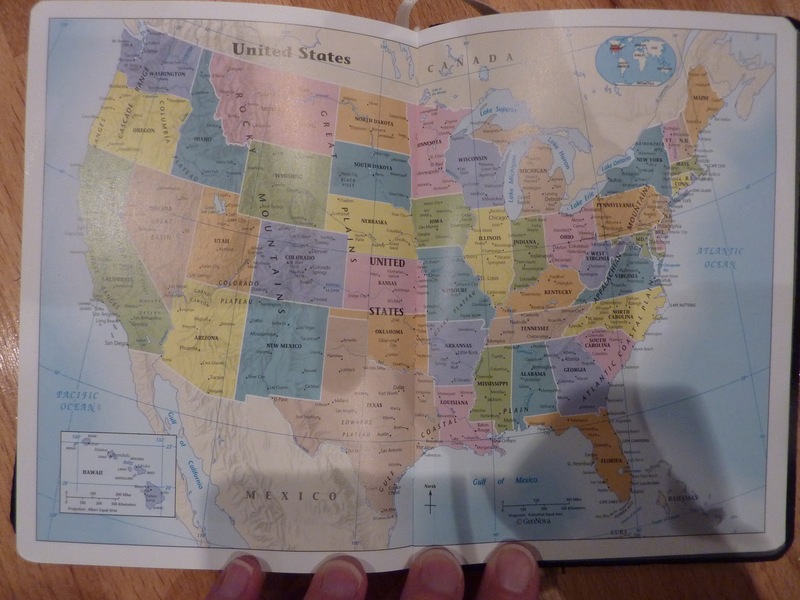 Inside the cover is the binder's information. I wonder if this company is still in business. 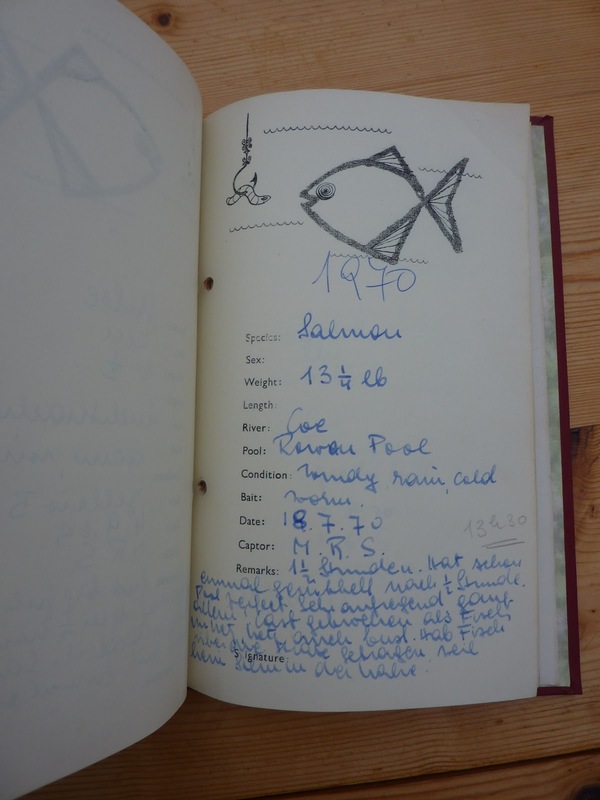 I'm not into fishing, but I found this journal absolutely fascinating. 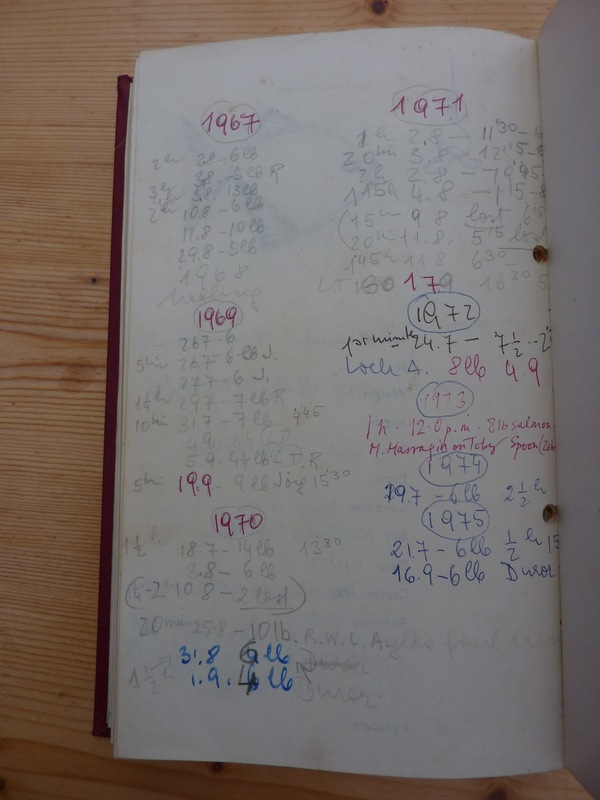 This is yet another example of the archival power of notebooks! Now that we are a couple of months into the year, let's hear what everyone is using and how well (or not) it's working for you. Filofax, FC and other ring-binder users: what size and style binder are you using? 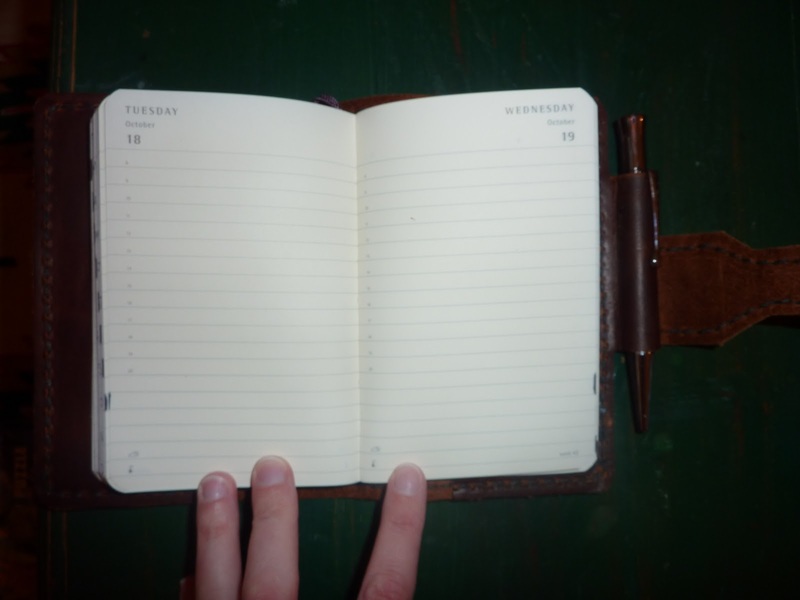 And the all-important question, what diary layout(s) are you using? 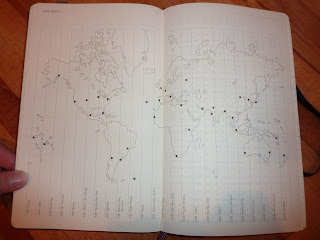 Bound-book planner users: what are you using? Weekly or daily, large or pocket? And everybody: are you happy with how it's working? Does it need a little tweaking? Or are you experiencing Planner Fail and need a complete overhaul? 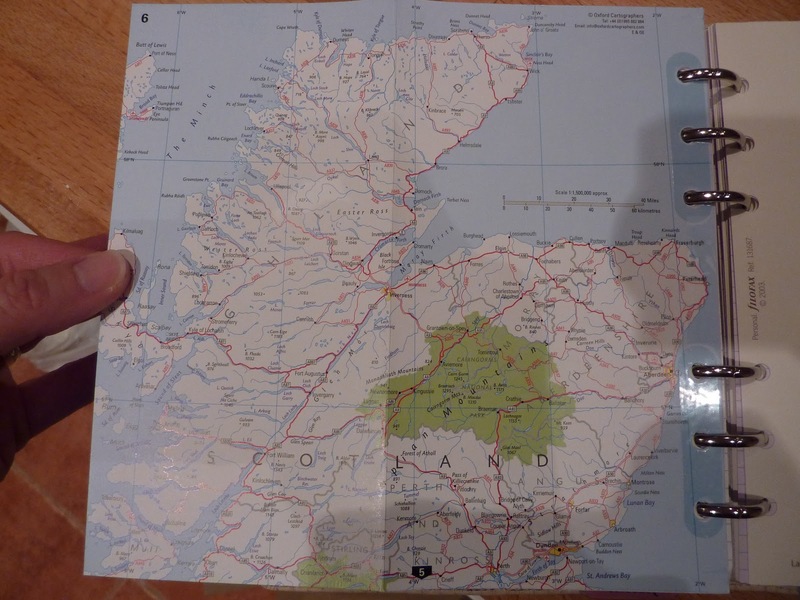 A few days ago I searched everywhere for my Move section I used in my Filofax last year when I was preparing for my move here to Scotland. The section contained pages of lists like what to pack in my carry-on bags vs. luggage vs. air shipment; house-hunting info; school searches, and more. Much of that information (especially the packing lists) would be extremely useful right now as I'm preparing to move again and am packing all the same stuff. I can't find those pages ANYWHERE. The entire section is missing! I know I removed the whole section from my Filofax after we moved, because I like to keep only currently-relevant pages in my main Filofax. But normally I file removed pages into the current-year archive binder. The pages from the Move section aren't in my 2010 archive binder. They're not in any of my other Filofaxes. They're not randomly floating around in my drawer where I keep Filofax inserts and extra pages. I'd be shocked if I did throw them away, because that is just not like me. 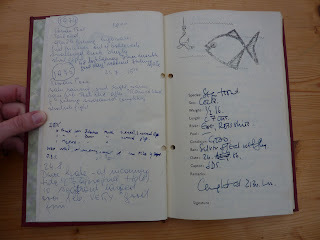 Before I consolidated my Move information into my Filofax, I had been keeping that information in two separate notebooks. 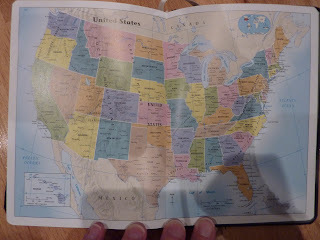 I had one notebook for this local area, where I wrote notes on what towns were preferable to live in, which schools were the best, lists of things to do after we arrived here, etc. 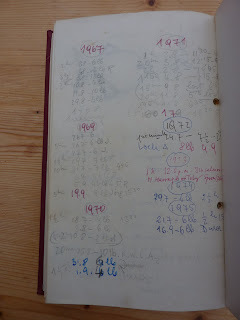 The other notebook had lists of things to do before the move like update insurance, sell our cars, arrange packout etc. as well as those all-important packing lists. These lists were in their infancy when I moved them over into my Filofax, but the basics are there and are still helpful. This has answered a question I've had for a long time: should I write important lists and preparations into a Filofax, or into a bound notebook? The answer (which I've known for awhile now but this experience sealed it): my lists are safer in a bound book. It's so easy to move Filofax pages around, put them someplace else, or lose them altogether, they are not secure enough to be referenced again later. 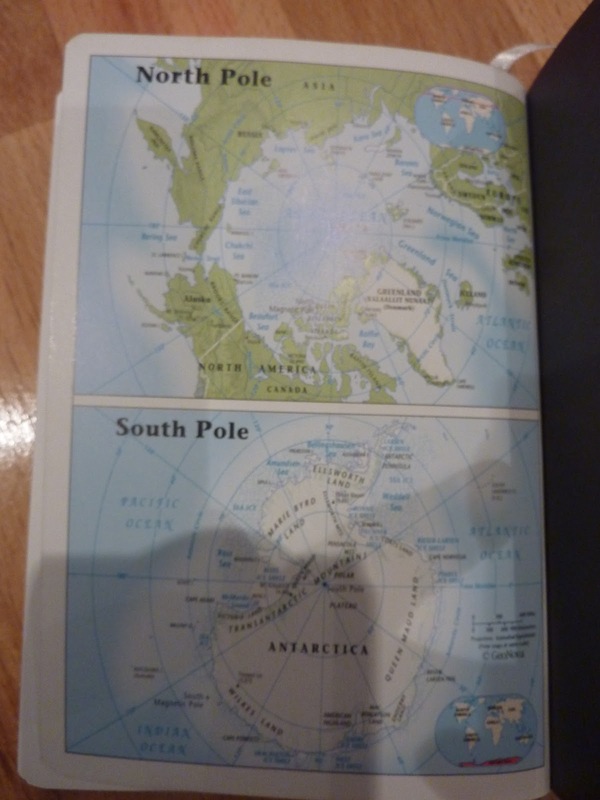 I never seem to remember where I put certain pages, and after they are removed from the working Filofax they are difficult to find out of context. When I write in a bound book, that information is safely captured unless I lose or throw away the book (which almost never happens). So my method for this move is to write all my lists and moving information into a hardcover blank-pages pocket size Moleskine notebook, which lives in my glorious Renaissance Art leather cover (which you can see here in my last post). It's small enough to carry with me everywhere (which is important to jot down things before I forget them) and it's pleasant to use which encourages me to use it often. 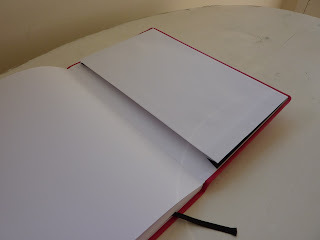 When I'm finished with it, I'll take the book out of the cover (and continue to use the cover with a new notebook), label the outside of the book with a silver Sharpie, and put it on the shelf. 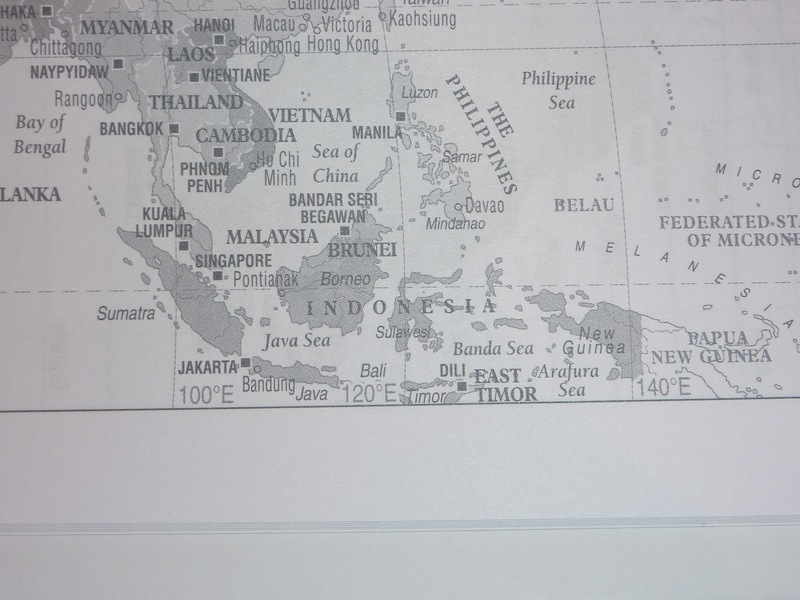 In the future if I need to reference it, I'll know exactly where to find the information I'm looking for. What about you? 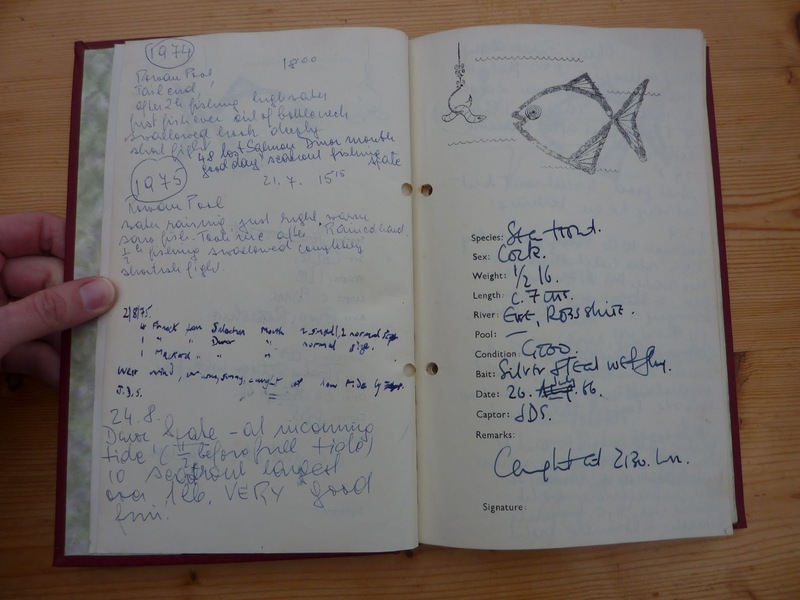 Are you more diligent than I am at archiving Filofax pages so you can find them again later? Or do you have to write things into bound notebooks for easy future reference? This is the stud-closure cover for the pocket size Moleskine daily planner (click here for the product page). I got the personalization, of course, because I love personalization! The Moleskine cover tucks into the leather cover securely. The stud-closure cover normally has a pocket in the front but I asked them to tweak it for me to hold the front cover of the Mole instead of having a pocket, and it turned out exactly the way I asked. Ren Art are great at tweaks, and are super folks with great customer service! 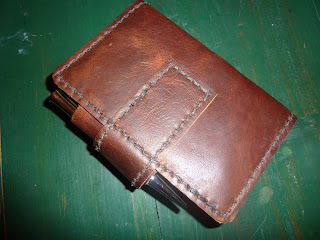 By the time I received this cover, predictably, I was no longer using the pocket daily Moleskine planner. 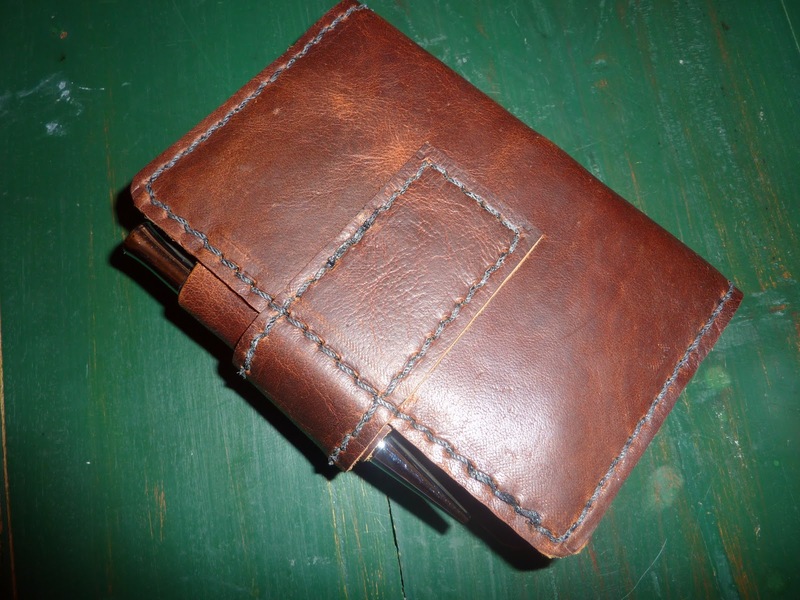 But, I have a pocket Moleskine notebook that I put into this cover, which is a little roomy in a nice, stuffing-potential way. The notebook that now lives inside this awesome leather cover is getting lots of action as I fill it up with my lists of what to pack where, what to buy before we move, school application requirements, information, and anything else I need to get down on paper. It's very convenient to have my pen in the loop so I never have to search for a writing instrument when I need to jot down a note or add items to one of my many lists. 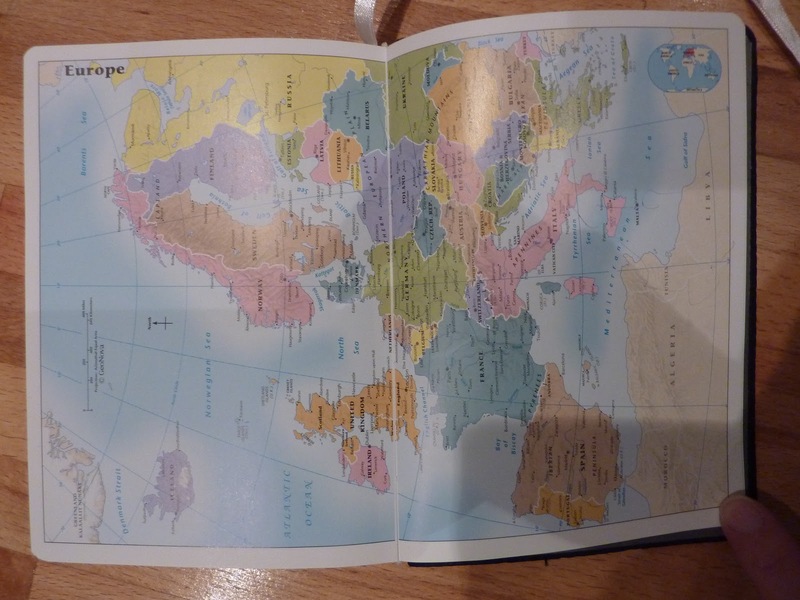 As I've said many times before, I love maps in my planners. I actually use them, and often. 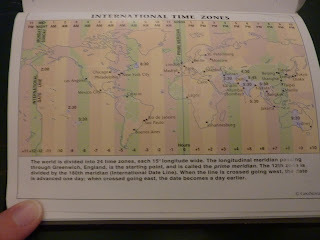 I especially use time zone maps, since I live overseas, and have friends and family all over the world. 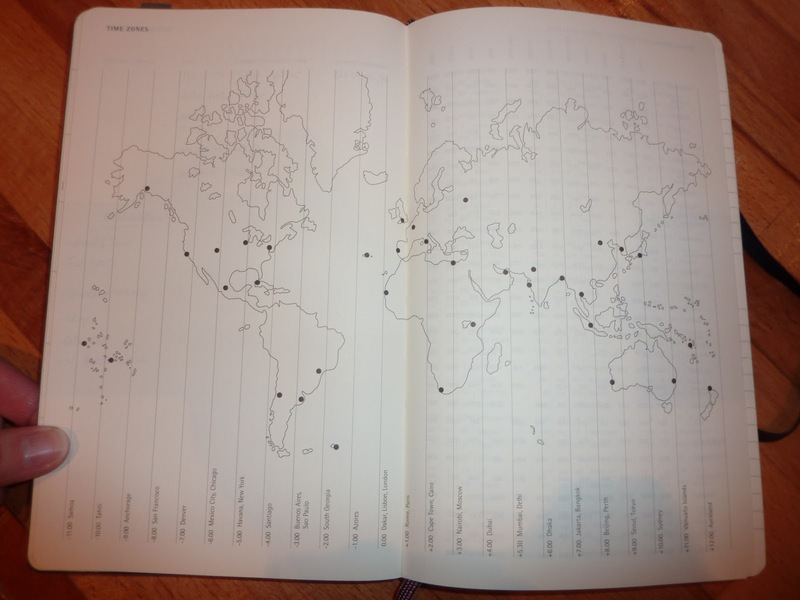 I bought my first Time Traveler planner in 2005, mainly because of the maps, and bought another one in 2009. They have an excellent time zones world map (which is also one of the very few I've ever seen which accurately notes that Nepal is in its own time zone of 45 minutes, not on 30 minutes like India). Click on any of the photos below for a larger view. 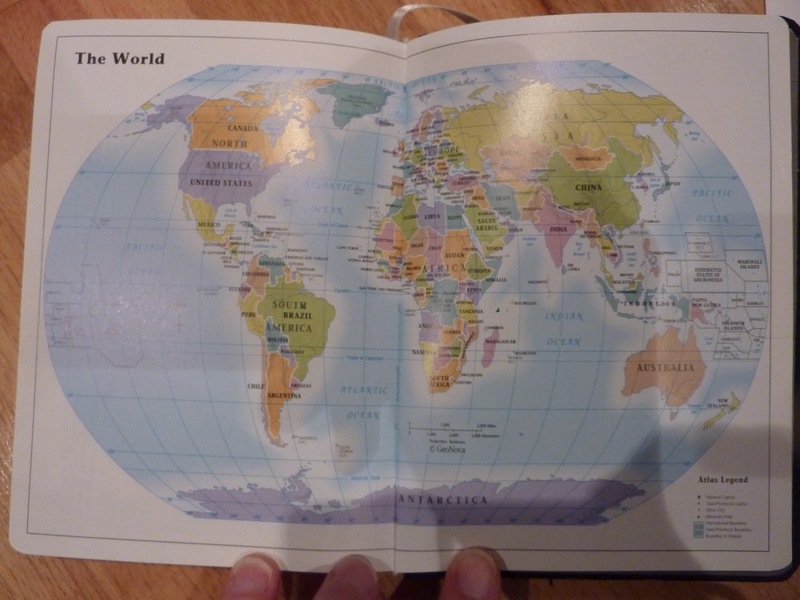 Africa, the Americas, everywhere. 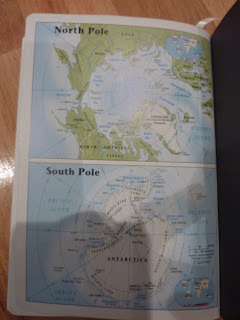 Even the North and South poles!! 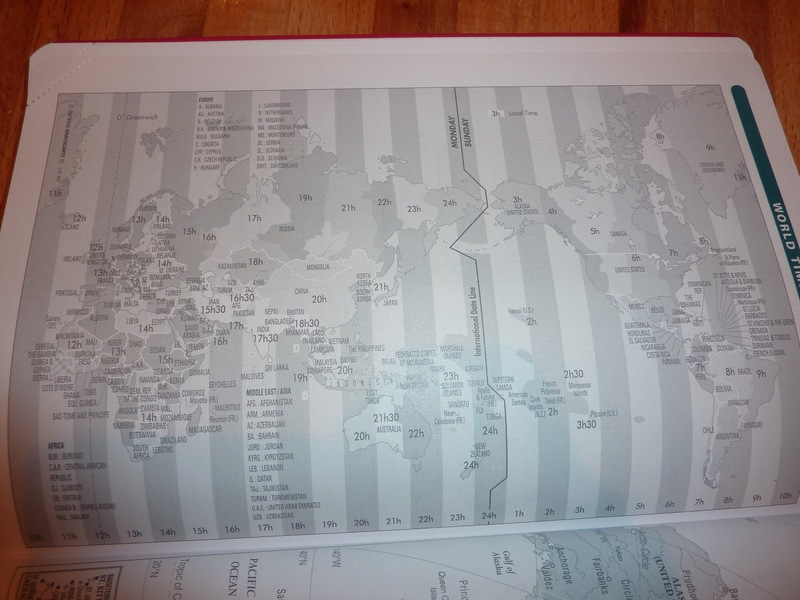 The Time Traveler planners also have loads of pages of international information like holidays for lots of countries, international calling codes, clothing sizes, measurements and conversions, an extremely handy chart of international paper sizes, and more. And it has monthly calendars! They are great planners and in fact I'm resisting the urge to order one up right now! You knew this was coming: impending move = planner crisis! The crisis of the week is crazy vaccine schedules. All of us have to get multiple vaccines, at specific time intervals. The kids also have to get medical exams for school applications. Packout and departure dates are yet to be determined. There's so much to plan ahead for, predictably the Moleskine day per page planner wasn't cutting it. I needed to see a week at a time to schedule multiple appointments throughout each week. Even the small but functional monthly calendars in the Moleskine couldn't handle the planning load. 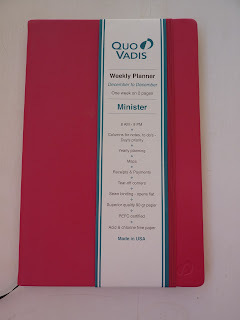 Christine's recent post on her Quo Vadis President planner got me thinking about my Quo Vadis Minister planner, which has the exact same format as the President but in a slightly smaller size. Those of you who have been reading my blog for a long time may remember that I used a Quo Vadis Minister Equology planner at the beginning of 2010 and loved it, but eventually abandoned it due to lack of monthly pages. (Click here to see my full review of the Minister Equology in my photo set on Flickr.) I don't know why I never thought of printing out monthly calendars and sticking them in, because it's so easy. (Click here to see how I printed monthly calendars for my Trinote planner). Last fall my Trinote saw me through my move to Scotland beautifully, but I longed for something more portable. The firm yet flexible cover closes with an elastic strap, keeping it closed and protected in my bag. Another happy discovery: the Habana version has a couple of blank pages at the beginning and end of the bound pages, giving me several pages for notes, lists and reference information instead of just the one notes page in the refillable-cover version. The week at a glance with boxes for notes is keeping me organized with everything I have going on. It's nice to return to this familiar format after I used it last year too. 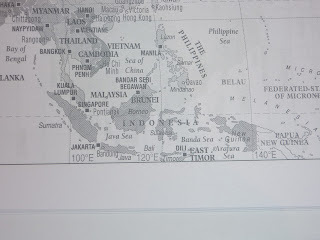 I've been using the maps a lot lately (more on that in my next post), and I need the international dialing information (which includes Indonesia!). 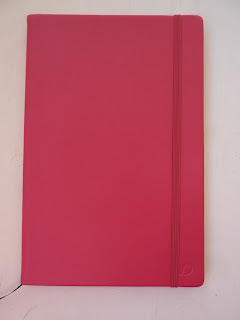 Another thing that's useful for me right now, which my Moleskine lacks, is the Minister's annual planner for next year. 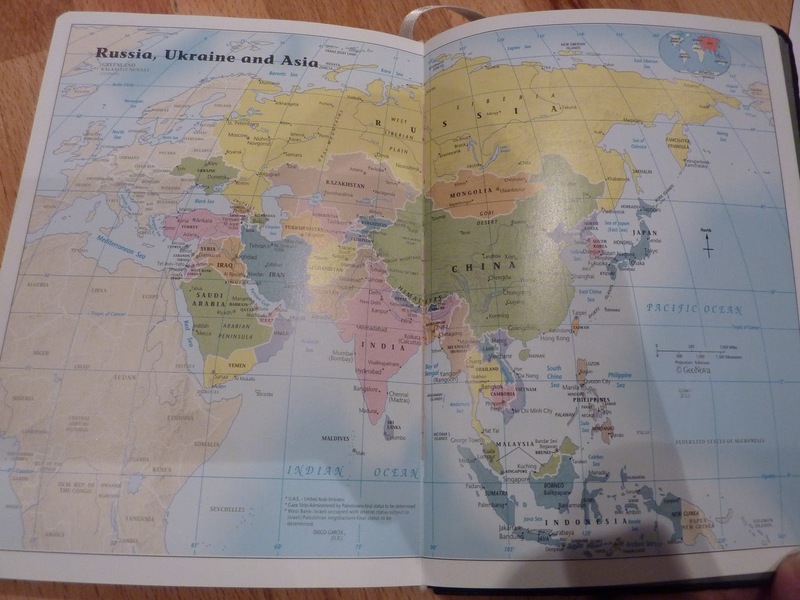 (Photo shows this year's but next year's planner is the same format, with the entire year across the two-page spread with months as columns). Something else that's great: the bound Habana Minister has tear-off corners AND a ribbon placemarker. So now I have easy access to all 3 calendar formats: I tore off the corners starting at the right corner of the annual planner in the front of the book, and tore off all the corners up to the current week. So when I flip to the left, I get the annual planner, and when I flip to the right it opens directly to the current week. Then I use the ribbon to mark the current month's calendars (which I have taped into the book). So the combination of the weekly layout with space for lists; portable slim size; maps and international reference material; pretty cover with elastic strap closure; and the addition of monthly calendars makes the Minister a winner! Here is another excellent guest post from Christine, about her Quo Vadis Equology President weekly planner with 100% recycled paper. I love her creative use of color on her weekly pages!! Click here for the Quo Vadis President weekly planner product page. Click here to learn more about Equology planners. Click here for the Quo Vadis USA website. 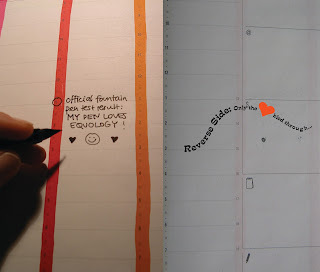 Thanks to Leah and Karen from Exaclair, the Quo Vadis President of the Equology line is my main planner companion in 2011. Despite some initial apprehension about its large format (well, I got what I asked for! ), the President quickly turned out to be exactly what I needed. I carry it (may I say, him?) everywhere, often with some papers tucked into it. The format (8 1/4 by 10 3/4 inches, or 21 by 27 cm) is just too small to fully cover a 8.5 by 11 inch paper, but it’s still useful for documents that don’t mind dog ears, or smaller papers and standard envelopes. Mr. President weighs 544 grams but strangely he feels much lighter to me. 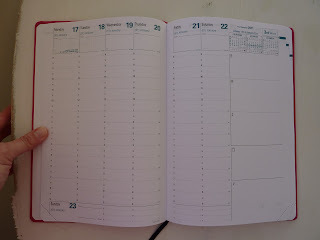 I used to use an Ecojot planner that weighed slightly less but seemed so heavy that I rarely carried it with me. So maybe it’s simply all the great features of the President that make its weight insignificant. The Equology cover is made from recycled plastic and feels, as Leah put it, pleasantly similar to a cat’s tongue. The inside cover page lists its main features, such as being a 13-month planner starting in December. What follows is a “Personal Notes” section for only the most relevant information (unlike a certain popular planner line that demands your credit card number!). I like the bottom section describing how to best use your planner. 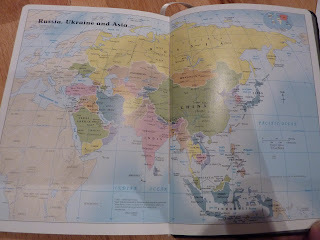 Next page covers “International Telephone Access Codes”, which again has added how-to information guiding you through some specifics of making international calls. 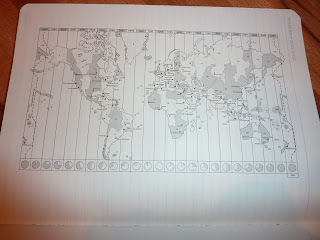 Next, a full page provides “Minimum and Maximum Monthly Average Temperatures In the World” for 46 major global cities. 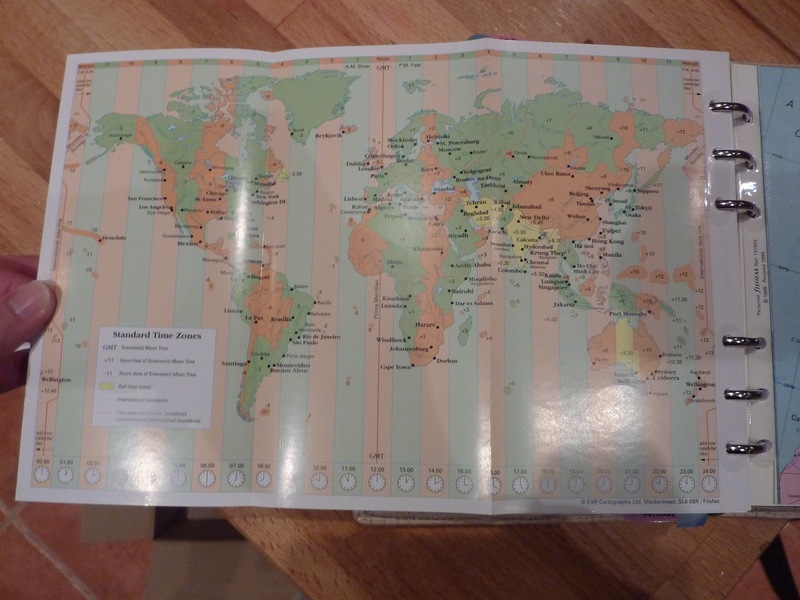 This is followed by a “Chart of International Holidays” for 31 countries. 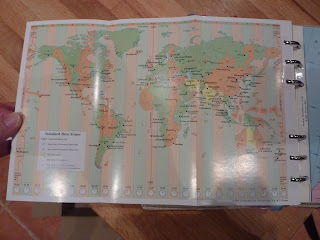 The next two pages are a monthly planner for 2011, highlighting Sundays and holidays in the US, Canada and UK. Each day provides about one inch in length of blank space. 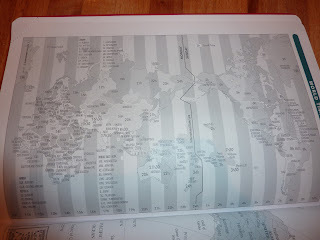 Then the weekly planning portion begins, with late November / early December 2010 in my case. The pages are set up to display vertical columns from Monday through Saturday, while Sunday is a horizontal box along the bottom of both pages. The edge of the right page features 5 boxes with symbols for the following information: Phone, Internet/Email, Payments, and 2 boxes for Notes (one of them could be used for random notes, and the other for written projects, for example). Each space is 4.2 by 10.5 cm, or approximately 1.5 by 4 inches, with the bottom space being 6 by 10.5 cm. Each daily column lists the number of the day as well as the number of remaining days in the year (for example, November 29: 333-32), something I appreciate and haven’t seen in other planners so far. The top of the column provides a priority box, which I use for lists whenever there’s nothing pressing to do that day. The day is timed from 8 am to 9 pm at half-hour intervals and lines at each full hour (a little less than 2 inches, or 4.3 cm to be exact!). I love the fact that this saves space for writing, as I only need to circle the times I have appointments or meetings. Have a date from 3 to 5 pm? Simply circle both times and connect them with a line. Perfect for the more visual ones of us. The upper right corner displays the week we are in (such as, “48th week”) and three mini monthly calendars: last month’s, the current month, and next month’s. These tiny calendars are not for notes (which might be overkill) but simply for reference. Replacing the ribbon common to many planners, the bottom-right perforated corners allow for the quick locating of the current week. Personally, I prefer tearing off the corners over a ribbon, which I’ve often found cumbersome and dangerous for my string-addicted cat. The Equology paper: the Quo Vadis website states the recycled paper weight to be 89 grams, as opposed to 90 grams for its standard non-recycled paper. When seeking the most sustainable paper products available, it is important to look for a high percentage of “post-consumer” recycled content, as this process literally recycles paper from households and businesses rather than only using paper factory trimmings. Since recycled paper, especially given the choice, is very important to me, I can’t speak to the quality difference between this paper and the kind used in the conventional Quo Vadis line, which I’ve never tried. Not that I care, because I am perfectly content with the thick Equology paper that works well for my writings and drawings. For the most finicky ones who are curious: one side is slightly smoother than the other, which however had no effect on my fountain pen experiment: Some people state to experience problems using fountain pens on recycled paper (note that there are different degrees of quality, as with regular paper). I bought some ink and tested it with my 23-year-old fountain pen. I had absolutely no issues with it, and I’m not just saying this due to being ‘environmentally biased’. One thing I love about the large format is the space it allows for drawings. I’ve had so much fun personalizing this planner that I could easily fill up the pages until July. Drawing with markers has the disadvantage of slightly bleeding through on the other side of the paper. For this reason I’ve only drawn on every second week of the planner. Following the main planner section, a monthly calendar of January next year covers two pages with 3.7 by 4.3 cm boxes, and a 7 by 23 cm Notes section along the right edge. The next two pages show a monthly calendar of next year in the same way as the current year at the beginning of the planner, with the addition of monthly priority fields. 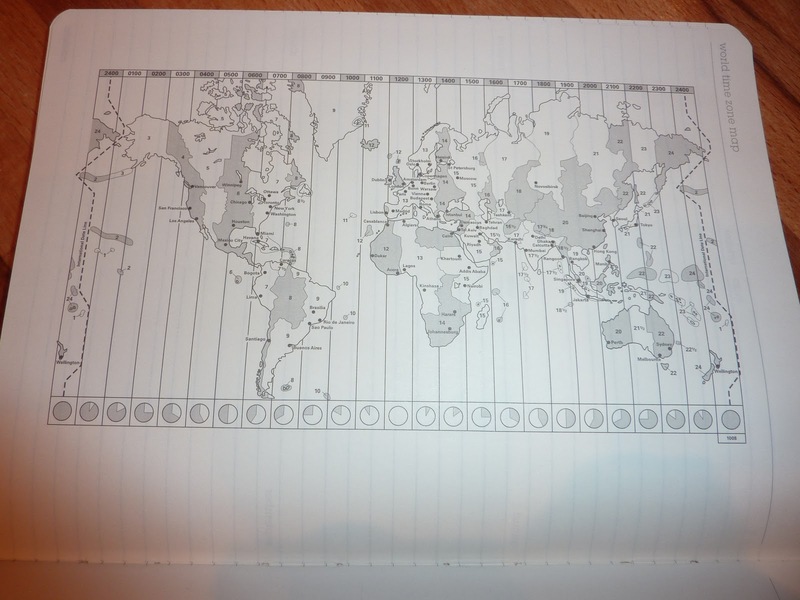 Then come the maps: World Time Zones, North America, Canada, USA, South America, Australia and New Zealand, Europe, Asia, and Africa, followed by a ruled Notes page. Two receipts and payments pages each cover the next four pages, providing space for each day of the year. 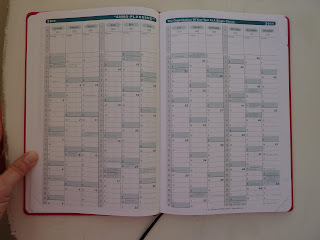 The last page is a small monthly calendar overview of the previous, current and following year. Last but not least, the removable address booklet features a full notes page and contact info table from A to Z. If you are looking for a 100% post-consumer recycled paper planner with a multitude of useful features and a larger format than most out there, Mr. President will reliably be at your service. Many thanks again to Christine for this excellent review! This has nothing to do with planners, but I wanted to say I just got back from seeing my very favorite band, the Old Blind Dogs, play LIVE, and they were spectacular!! It was by far the best live gig I've ever seen. And how wonderful for me to get to see them here in Scotland. They played a great mix of songs from their new CD and older ones. 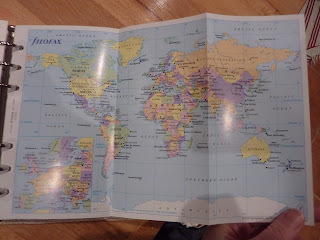 Over the years I've listened to their CDs while I was in such far flung locations as Washington DC, Russia and Albania. Hearing those songs live took me back on a journey through my own personal history: there was my favorite song I listened to so often when my daughter was a baby in Moscow; here was the song from their first album I bought; I sang along with them to MacPherson's rant, which my kids and I danced to at full volume in our living room in Albania. So many great songs, and so many happy memories attached to them. Several times during the show I thought to myself, "HOW are they DOING that??" I've never seen instruments played like that before, wow. They are all amazing musicians. As if they weren't great enough as musicians, it turns out they are also really nice guys! During the break in the middle of the show they hung out and talked to us, and graciously signed copies of their new CD, which is aptly named (in my circumstances) Wherever Yet May Be. It took restraint not to elbow people aside to get my copy signed! I got to talk to Jonny Hardie, who plays the fiddle like magic, and it was all I could do not to GUSH about what a huge OBD fan I am!! I tried my hardest not to completely embarrass myself in front of him. Then I saw Aaron Jones (who plays this very cool stringed instrument called a bouzouki and also sings) and Fraser Stone (who is amazing on percussion) and wanted to chat them up a little bit. I follow Aaron on Twitter (and you should too: @The2Duos) and awhile back I tweeted him that I was really looking forward to the show. He kindly replied and said to say hi to him at the show--he's the one who stands, Fraser's the one who sits. So when I met Aaron, being the smartass I am I said, "So which one of you is Aaron, the one who stands or the one who sits?" Aaron actually remembered tweeting me that and looked at me and said, "Ah! I expected a giant Filofax!" He and Fraser very kindly took the time to chat with me for a few minutes, and again I had to force myself not to gush. These guys are great! So if you ever find yourself lucky enough to have the opportunity to see Old Blind Dogs, don't miss it. They are amazing. And if you don't know what I'm talking about, you must get their new CD Wherever Yet May Be, and check out their older stuff too. Many thanks to Nancy for sharing her brilliant method of combining her Filofax with a Moleskine cahier as her daily planner! I absolutely love this method! "I just started using a pocket-sized Moleskine cahier so I could have one day-per-two pages for my pocket-sized Urban Filofax. On the right side I write the numbers 7 through 9 (7am - 9pm), with the date at the top, and then fill in the page with my day. I only fill out a template for one page at a time. On the left side I write notes - to do's, observations, etc. 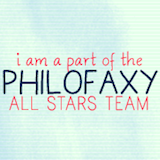 I wanted more space, with no rings, than the Filo pre-printed pages afforded. Oh, and I wanted it blank (no lines). So I take the little cahier, with doodle-friendly, paper-bag-brown cover, and attach it to the inside back cover of my filo with a paperclip clamp at the bottom (what are they called?). 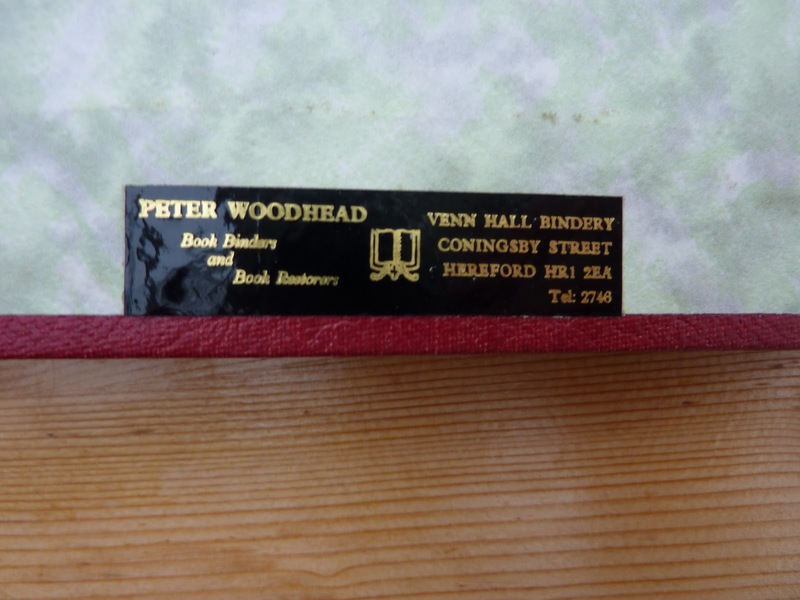 I attach the clip so the book flips open to the current page - love it! 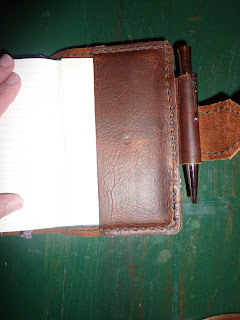 The notebook actually stays wedged in there without the clip, but the clip makes me feel more secure and I don't have to think about holding it in place when I swing open my planner to get at the billfold in the check-out line. ANYWAY... maybe you could piggyback a cahier to your notebook? They come in packs of three, so there's always more if you fill up the first one." I think this is absolute genius! I love how it solves so many issues all at once. There's the permanence of having all her reference info on the Filofax rings, yet she is able to have the larger page size of the Moleskine AND two pages per day!! 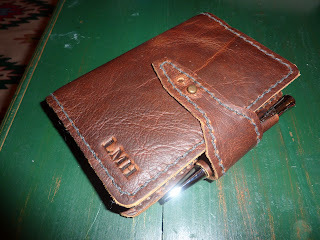 Check out her AWESOME customization of her Urban Filofax!! "I decided not to worry about any damage the clip might do to my FF because (a) it is denim, not leather, and (b) I've decided to adopt the 'Wreck Your Journal' philosophy and really commit to thrashing my planner in the name of good, hard living. 'Hard' as in well-used, not as in a candidate for re-hab. Enclosed find four pics showing the cahier addition, including a sample page for tomorrow (the two pages will be covered with notes, eureka moments, post-its and drawings by the end of the day). If I feel like writing at length, I remove the cahier and write in subsequent pages until I feel like stopping. And then I can just start the daily page at the next blank page." Nancy, this is fantastic, and inspirational. Thank you for sharing it with us! !